We have had a lot of rain in the past few weeks where I live. It has been welcome, as we were in a severe drought for several months. The gardens and trees love the rain and our Louisiana landscape is once again green and vibrant. 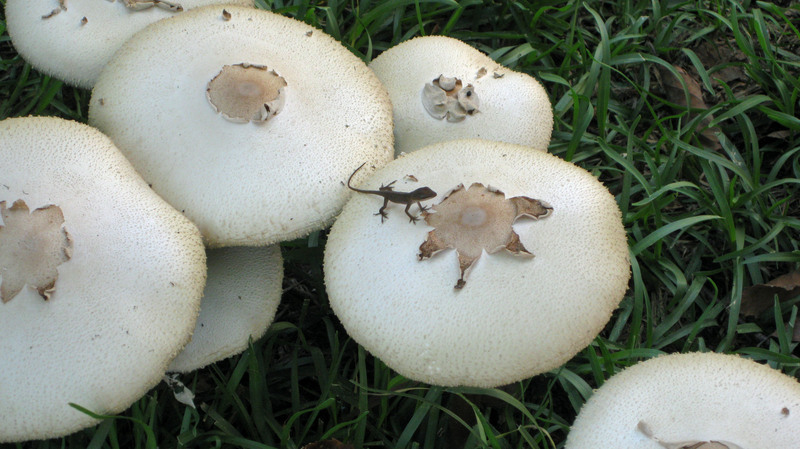 One of the wonders of all this rain is the mushrooms that are popping up everywhere. Driving around on a pretty Saturday morning, I was enchanted with the patches and rings of jaunty little caps. There seems to be no rhyme or reason associated with their appearance, some quite large and elegant, other short and squatty. I was a little disappointed that my yard wasn’t blessed. Wonder leads to curiosity and I decided to do a little research. The first thing I discovered – there is a fungus among us (sorry, I couldn’t resist.) Even further, they are closely related to mold. Not good, since I am allergic. I’m losing the magic here. Further investigation yielded the information that these are also known as fairy rings in European folklore. This is much better, I like this idea. Magic rings springing up in the wake of fairies, pixies and elves. This morning I grabbed my camera and set out to capture a few photos before my enthusiastic neighbors fired up their lawnmowers. As I strolled out of my house, I glanced over to the area between my house and my neighbors’ fence. Oh my! My yard WAS blessed! As I was snapping away, I noticed a little friend. Not a fairy, but still a cute little surprise. 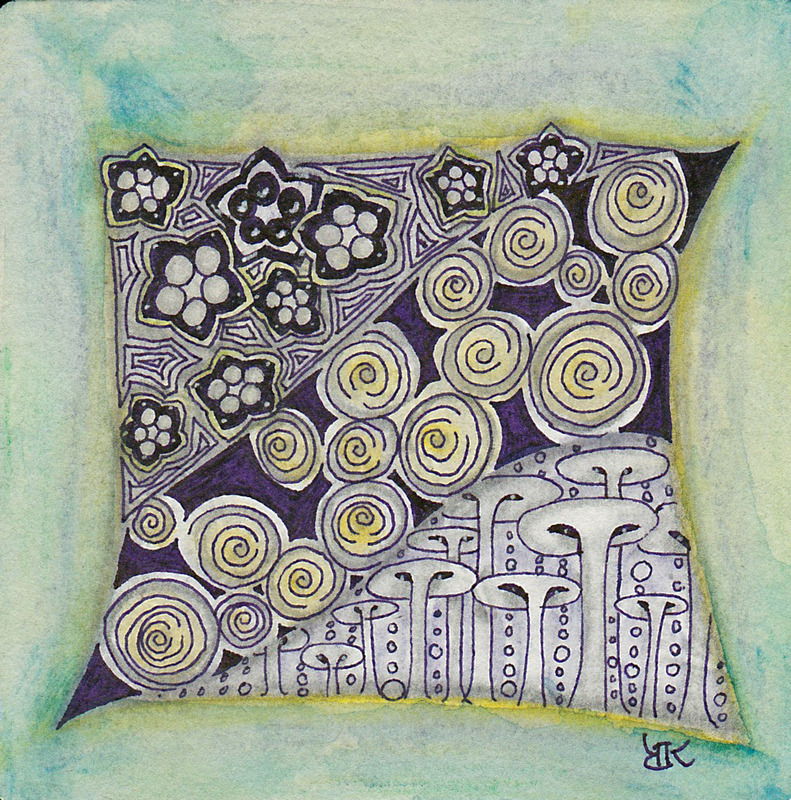 My fascination with the mushrooms seems to have emerged in my last few Zentangles, with a very distinctly mushroom looking tangle finding its way onto my tiles. 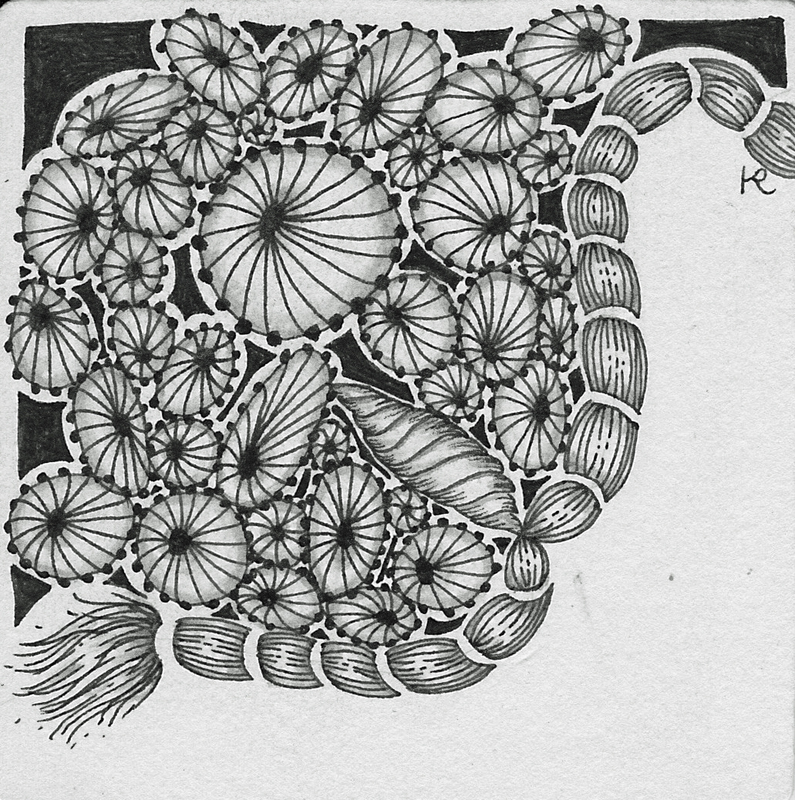 This is not unusual, as many tangles find their roots in nature and patterns we see around us. 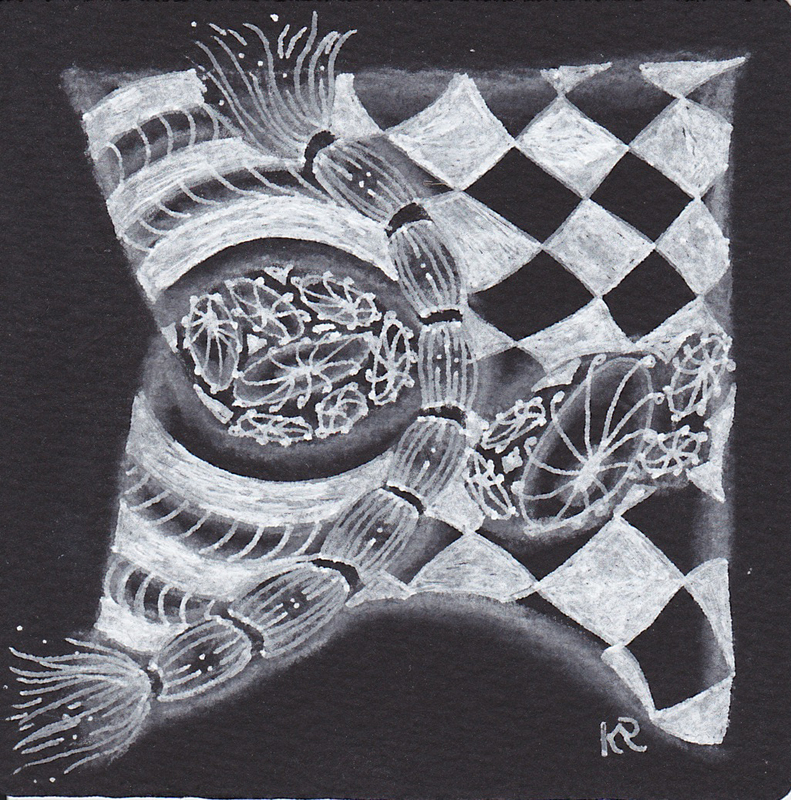 Usually it is more deliberate and tanglers work to distill these patterns into the fewest possible strokes while capturing the spirit of the design. Not so for these, they just sprouted up on my tiles. Like a magic fairy ring. These words keep replaying in my mind as go about addressing the various challenges before me this week and plain old daily living. I attended a workshop at The Red Shoes presented by Linda V. Allred on the power of the subconscious mind. She is a great speaker with a passion for life and paying her own gifts forward through her work as a certified hypnotist and wellness coach for women. 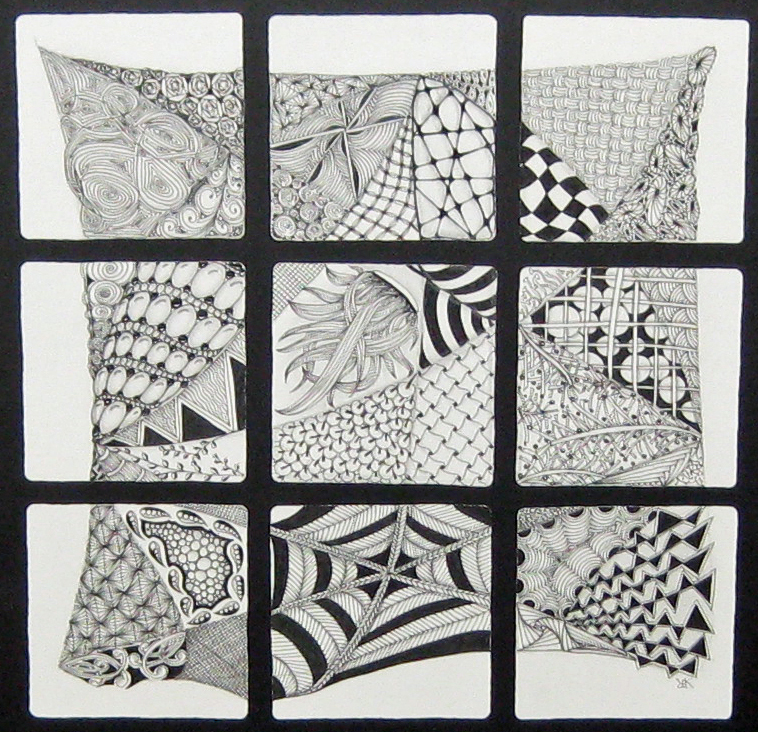 A philosophy closely aligned with my own decision to teach Zentangle. She shared her story and her profound belief that we have a power within us to achieve so much more – proclaiming “Don’t live small. Live big.” Wow, such a simple statement, yet very profound. I quickly jotted it down – not wanting to lose that thought. I have been giving that short statement a lot of attention in the last few days. How do I use that to be better? Certainly, there is always room for improvement and growth. Linda also used the metaphor of driving through life with one foot on the accelerator and the other on the brake. For me lately, this has been a little niggle that hovers at the edges of my mind telling me things aren’t quite right, but I can’t define the issue. I believe happiness is a state of mind. Some people have a natural affinity for finding the positive in every situation and others have to work a bit harder and consciously choose to be happy. Even as a young girl, I recognized the power of my thoughts and regularly used positive affirmations and visualization to achieve my goals. Somehow, I misplaced those habits over the past several years. It’s time to welcome back those old habits – they were good for me. This time they will be added to my tangle time. Hopefully, the positive thoughts will guide my pen as I continue on my tangled quest for tranquility. Thanks, Linda, for the reminder to live big. I’ve had an interesting week where my past, present and future have jostled around in my thoughts. My daughter’s upcoming wedding has been at the forefront of my mind as we secured the florist and attempted to give him an idea of what our Bride wanted. She isn’t as set as you might imagine Her only hard rule is no red roses. In fact, she left a very stunned florist as she stood up and announced she had to be back at work having never discussed the church or reception decorations. “My mom can decide all that, I trust her completely.” Wow, a lot of responsibility for a woman who isn’t really into all that stuff – but then, neither is our Bride. This is one more way my girls are different. Her sister loves all things associated with weddings. If she ever gets tired of nursing, she could be happy planning weddings for a living. One thing has been nagging at me as we begin to tackle the small details of this wedding. I was asked to design the invitations and have most of this done, but nothing so far that was truly unique to the couple. I had done the artwork for our oldest daughter’s wedding program and they were very specifically designed to fit her. But, as I said, the girls are very different and nothing has come to mind for her. 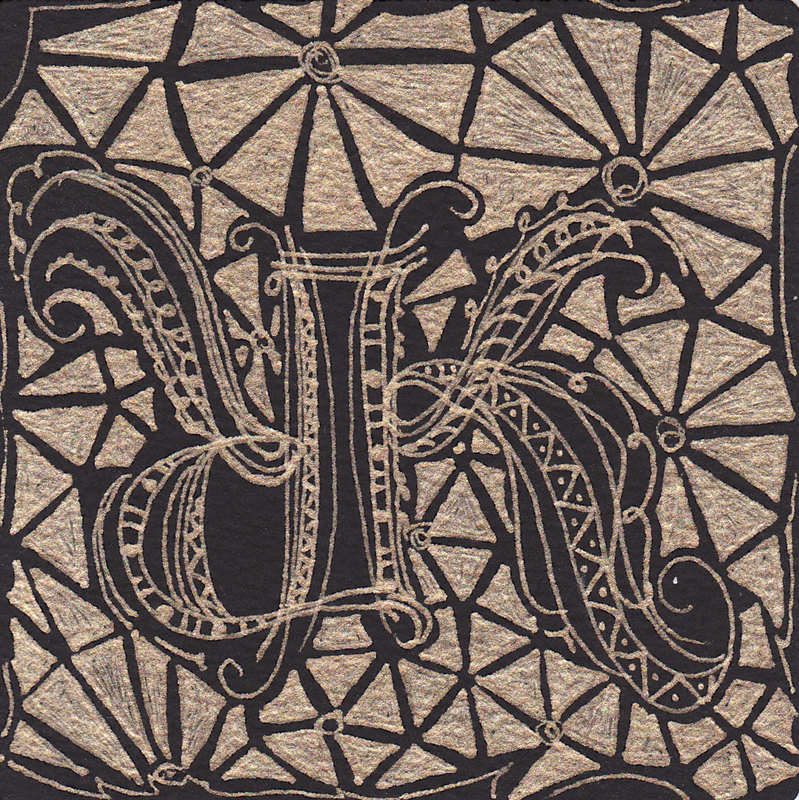 Finally, I suggested a wedding logo made up their combined initials to be used on the favors and save the date cards. Bride and Groom loved the idea and I was off and running. 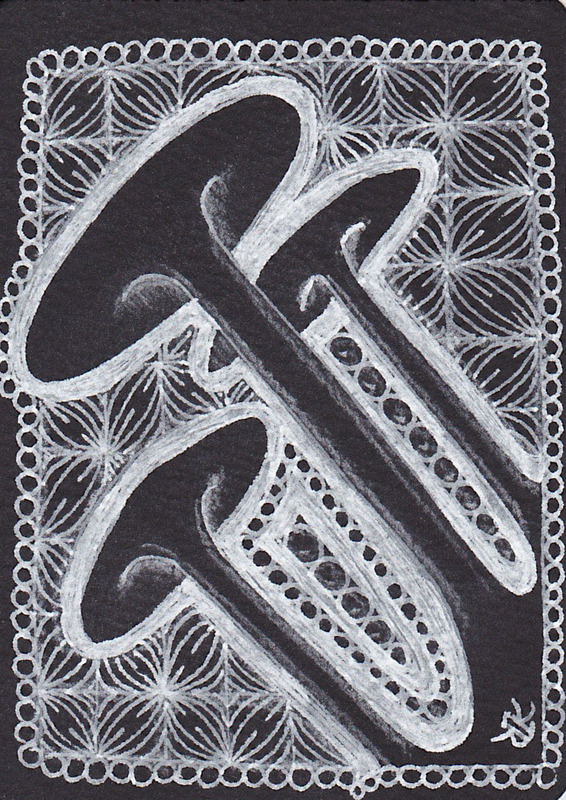 Of course, the final result is Zentangle inspired. Ah, but what of weeping guitars? My husband and I relived our courtship days this weekend. Would you believe it has been 35 years since Peter Frampton released his platinum album Frampton Comes Alive! We purchased VIP tickets and drove over three hours in a terrible thunderstorm to attend his concert in Biloxi. This was our first time to see him live and we were both blown away! 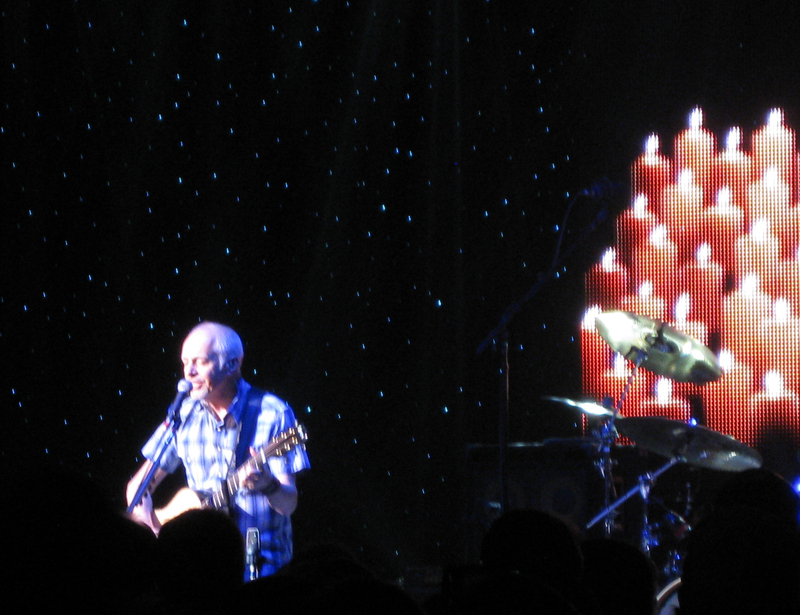 Peter Frampton performed for almost three hours, playing the entire original album and finishing with an incredible version of When My Guitar Gently Weeps that brought the audience to their feet. What a way to finish the week! 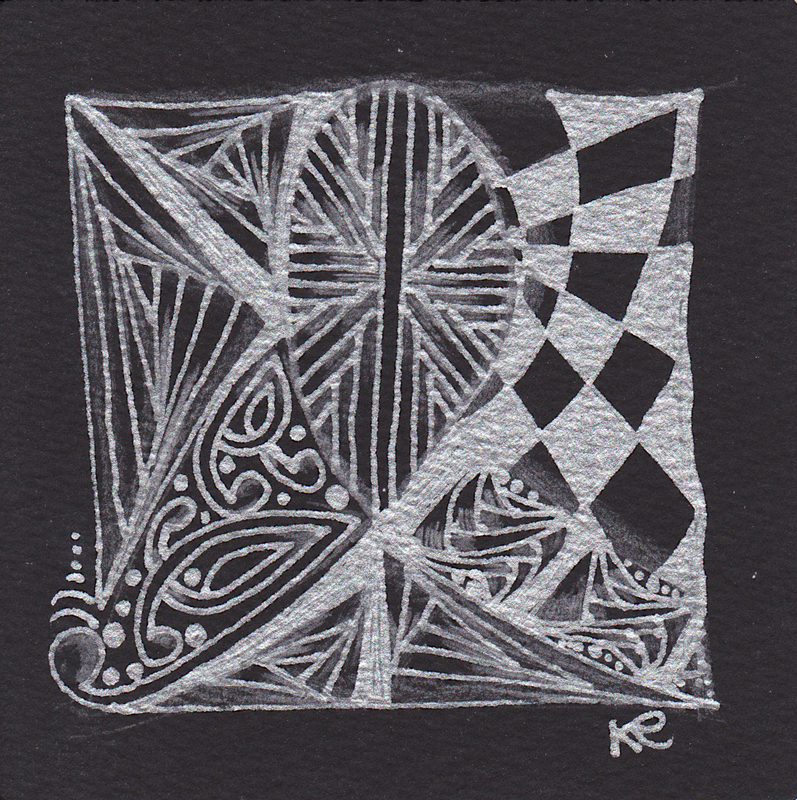 A large part of the magic that is Zentangle can be attributed to serendipity. 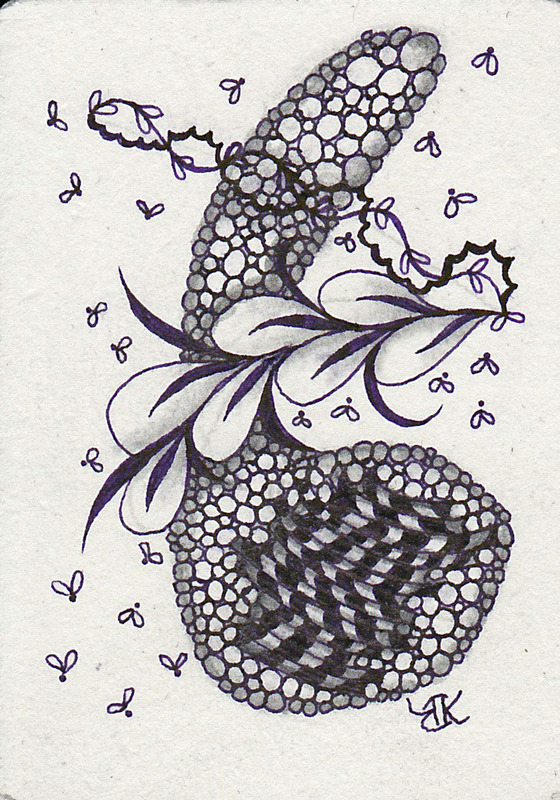 Each Zentangle is a little surprise when it’s done. The outcome is not pre-determined. In fact, my most beautiful works are those that have evolved naturally. Where I relinquish my need to control myself and my environment. 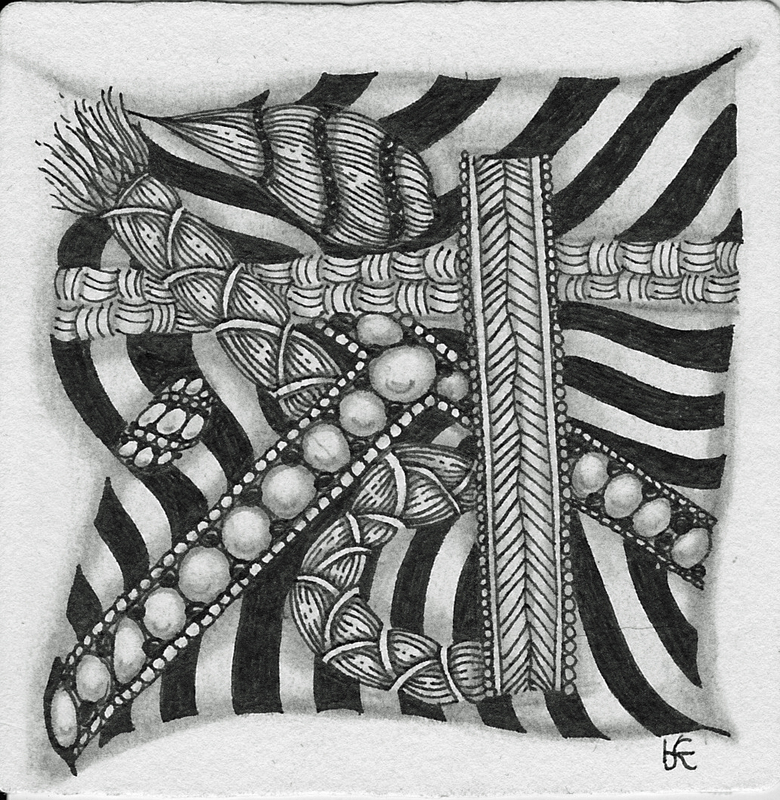 As I spoke with a new Zentangle enthusiast after my class last night, I realized that though I have learned to let go of the outcome, I do maintain some levels of control. He asked if I planned every tile because they all seemed to be very deliberate. While I don’t ever see the end result, I do take light and dark, scale and harmony into consideration as I choose my tangles for a tile. All those design principles pounded into my head at LSU have become a part of my DNA I suppose. He explained that he was having a hard time with the string and I understood perfectly. Sometimes the string can be a real challenge when starting a tile. While you rarely see the string in a completed work, the string is what binds the individual parts into a pleasing whole. My suggestion was to have his wife draw the string and he would work with whatever came. Hmmm…an insightful moment courtesy of a student. My CZT training was in February and at that time I purchased a set of ensemble tiles. These are sets of 9 tiles that are pre-strung. 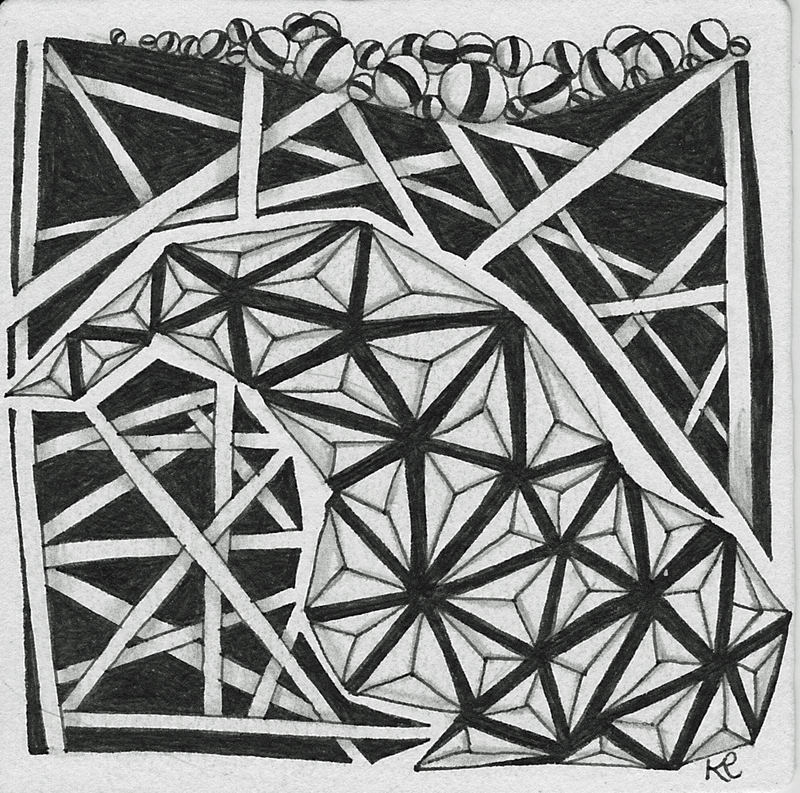 The intent is to create each tile independently and then re-assemble into a completed work. I was struggling with strings at the time and this seemed a wonderful idea. So why have I avoided working with this set for so long? I only completed my first set this week. As I spoke with my student, I realized that completing this ensemble had been an exercise in letting go for me. Embracing the intent of the set, I shuffled and completed each tile randomly – never checking to see how they might look together as a completed “tile.” I couldn’t judge what tangle might look nice next to another or if I had too much or not enough contrast. The only bit of control was in my decision to only use each tangle one time for the set. Yet there it was, a wonderful compilation when I was done. Maybe I should let my husband draw my next string. It has been a busy week for me. In addition to all my regular personal and professional obligations, I had the pleasure of teaching the first of a two-part workshop series at the Red Shoes. It was a large class of very interesting and talented people. The time passed quickly for me and the group posed many questions that made me think about my own work in a new way. The teacher and the student traded places a few times that evening. My own “lessons learned” were hovering around the fringes of my thoughts as I worked on this week’s Diva Challenge and influenced the final tiles in some subtle ways. 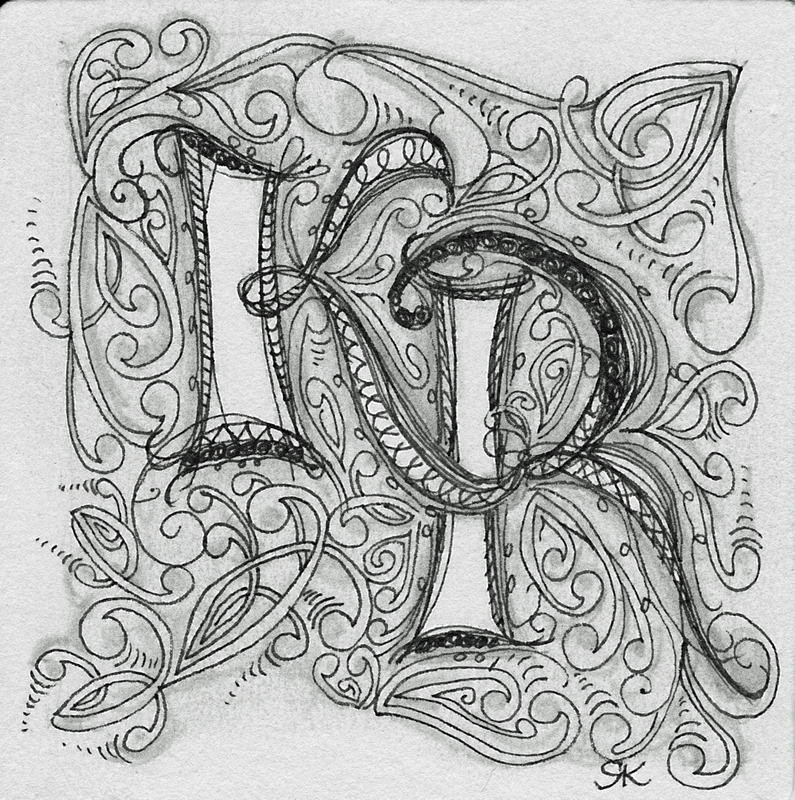 This week’s challenge is to use your initials as the string. I ended up doing several and may have resolved the issue of my “chop’ in the process. A “chop” is the distinctive initials/signature at the bottom of a piece of artwork. I have gone through several iterations with none really hitting the mark for me. I haven’t worked out all the details, but it’s certainly better than anything I’ve used before. 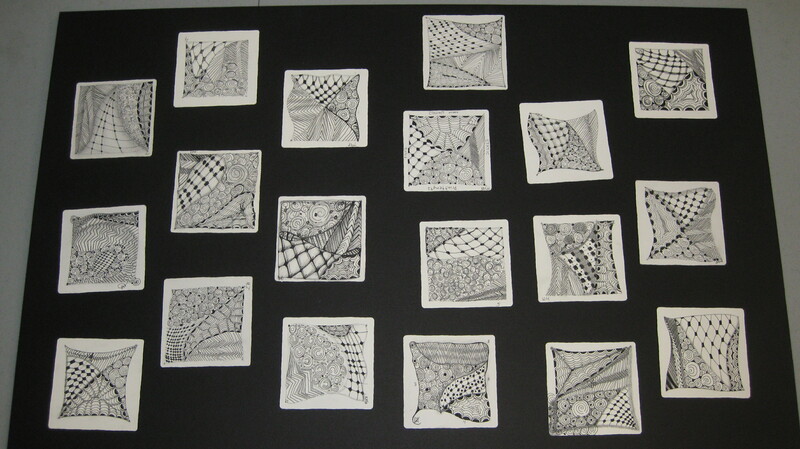 There is a special moment in a Zentangle class when everyone places their finished tiles together to form a mosaic. The room becomes quiet as everyone studies each tile and realizes their own is every bit as wonderful as all the others. I think of it as a mirror of sorts. Each person in that class gets the very same materials and instructions. All do the same tangles. Yet the tiles are each different, unique and beautiful in their own right, just like each student. I have also realized that the Diva Challenge is much like that moment in class, but shared virtually among caring friends. We all start at the same place, but make the journey our own. We learn from each other and grow better with each challenge shared. Thanks are in order this week for several people. My youngest daughter helped out as my assistant for the class – I could not have managed nearly so well without her. The staff at the Red Shoes, especially Wendy and her husband for getting everything ready and helping me tear it all down. 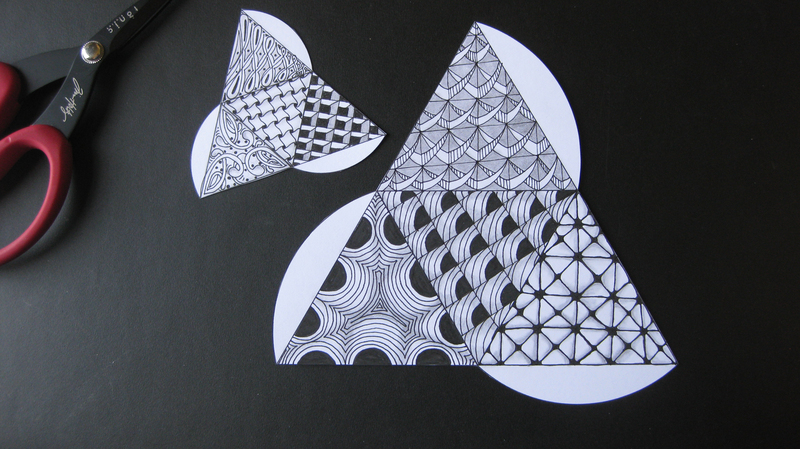 And to Sue Jacobs for sharing the link to some wonderful Zentangle inspired letters. Finally to my students, for the opportunity to share my passion with you and learn from you. It was truly my pleasure. While paging through a new book of inspirational quotes, this one seemed to jump off the page for me today. Ironically, Rick and Maria addressed this same subject in their blog recently. Perfectionism was something I worked hard to attain in my younger days. It sounded so important: “I am a perfectionist.” As I get older, and hopefully wiser, this doesn’t seem so good after all. That road is loaded with potholes, big and small. I’m getting tired of dodging them. Maybe the universe is trying to tell me something. Most of us love those perfectionists we encounter professionally. They are always on top of every little detail and seem to accomplish super-human levels of productivity. My family can tell you, living with a perfectionist is not always wine and roses. My husband will never let me forget the “sofa incident.” We were moving into a new house and buying our first new sofa in over fifteen years. We started looking when we broke ground for the house and were still looking when we moved in – with lawn chairs. I finally settled on one that had to be ordered and there was much rejoicing when it arrived. By everyone but me. There were some “lines” in the upholstery that did not match up. I would stare at the thing for hours and refused to sit on it. After about a week, he loaded it up and returned it. On the way home, he stopped at a furniture store and demanded I choose one. I was not allowed to look at anything with a pattern. We came home with a blue sofa that I never really liked very much. Over the years, I have tried to break this cycle. The problem lies with many years of perfecting the habit of perfectionism. I have made progress and now I mostly procrastinate. One more pothole on that road. 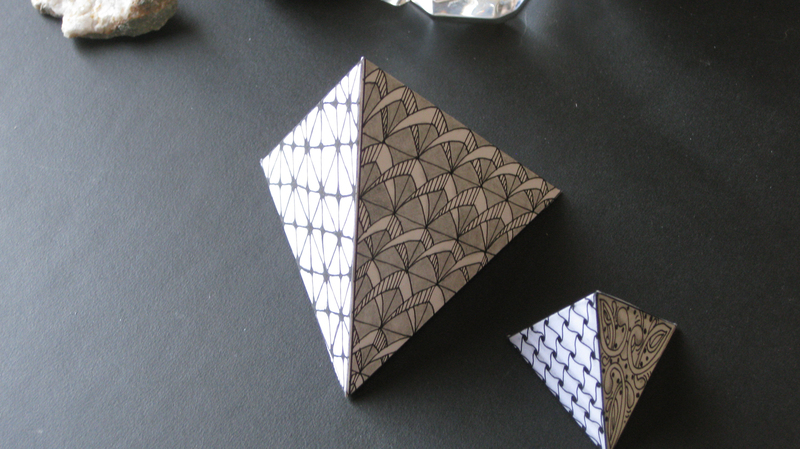 Last week, I got my shipment of the new black Zentangle tiles. I DO love black and white, so these tiles just called to me. What a quandary I was in, I had never worked on black and haven’t had much luck with the white pen when I tried it. Maybe I should wait a bit, think it over. After all, I would hate to mess up one of those lovely black tiles. By the weekend, I was pretty fed up with myself and decided to just dive in and see what happened. It wasn’t so bad, only one total reject in the batch. Riding the ripple in my puddle of success, I pulled out my markers and colored pens. Sue Jacobs shared her process for adding color and I had been thinking about using color for a few months. The first one is a real dud, but the others are not so bad. Just in case the universe is watching, the “learning tiles” are here too. For the past few years, my husband and I have been fortunate to visit some incredible places across America. Our vacations are usually a little off the beaten path and at odd times during the year. We visited Williamsburg, VA on the same day as Queen Elizabeth, experienced a snow storm at the Grand Canyon in May and enjoyed a free concert by Kool and the Gang in Mobile – all unplanned and utterly unique. More deliberate were visits to the homes of Thomas Jefferson and James Madison, Wisconsin in the fall, Jamestown, the town of Hershey (home of Hershey chocolate), the Jack Daniels distillery, the Smokey Mountains, Biltmore and several homes designed by Frank Lloyd Wright, including Fallingwater (a long-held goal for this interior designer.) On this 235th anniversary of our country’s independence, I reflect on all the places we’ve visited, the diversity of people and place and the abiding presence of the American spirit. We are fortunate to live in this country founded to protect the liberty of each citizen. I also remember the many places we visited where our forefathers fought and died protecting that liberty and the freedoms we enjoy. Thank you to those who came before and those who serve today – we must never forget that freedom is not free. 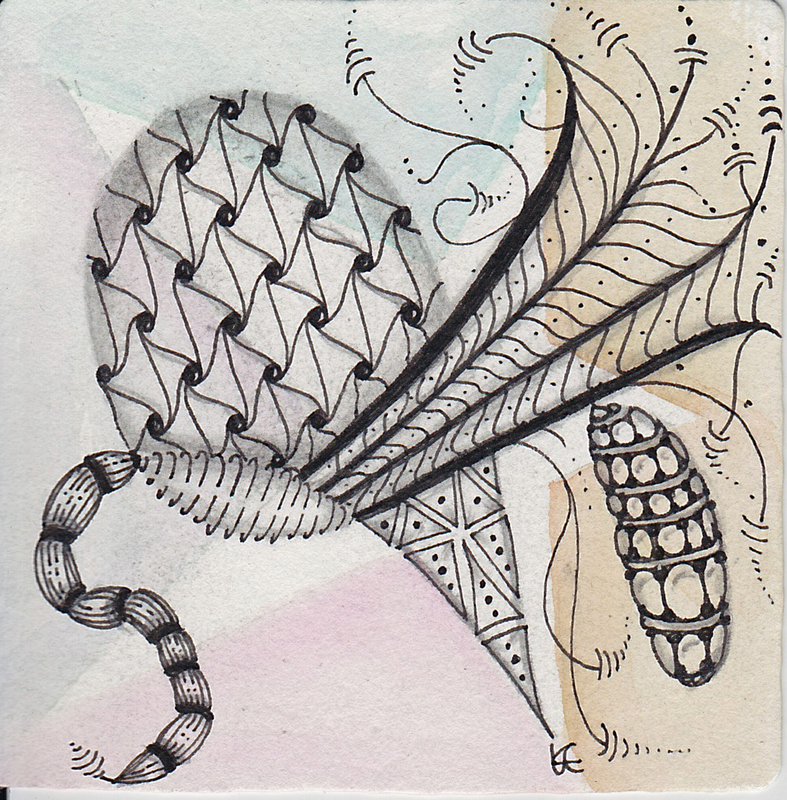 These are the things that wandered through my mind as I began my Zentangle this morning. 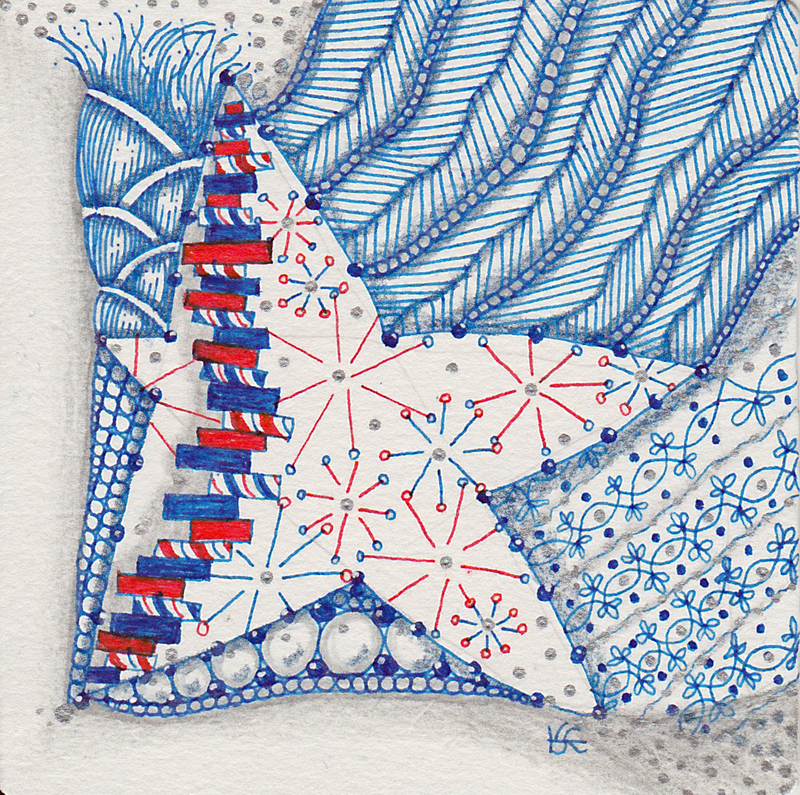 While I wanted the final result to represent this 4th of July holiday, as is the case with Zentangle, the result is a bit of a surprise. 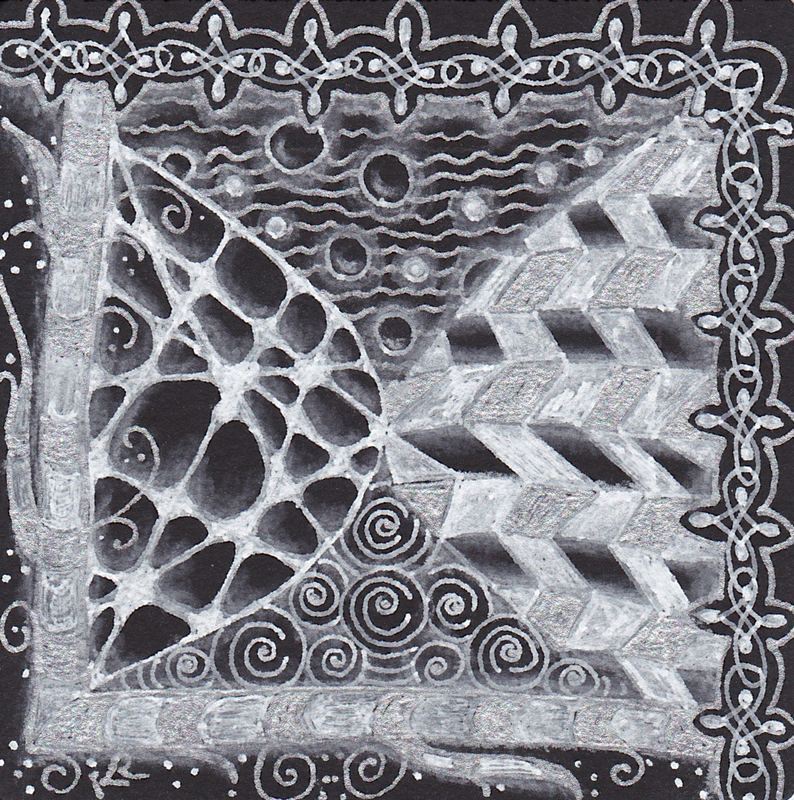 With Zentangle, it is important to know the “rules” and my intent was to follow them. But then I realized that America is a bit unique and we are often known to bend the rules a bit. My blue and red pens called for use today. Since I’m bending the rules, why not use a star for a string? Now that I have red, blue and a star, I need some stripes. You can’t have a 4th of July without the flag and fireworks. 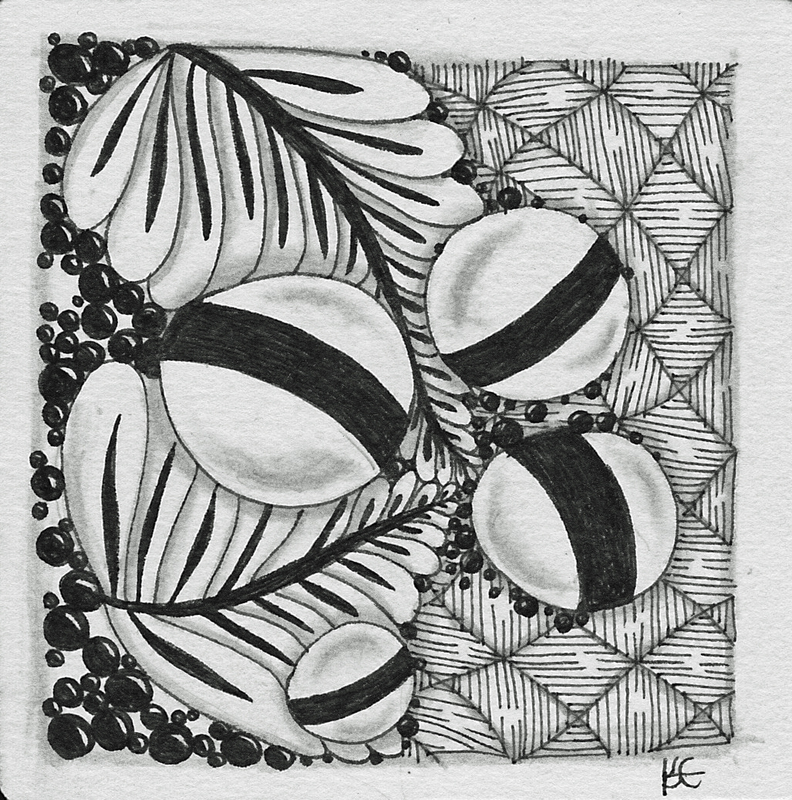 In true Zentangle fashion, as I reflected on the final result and viewed it from every side – it was better at an angle different from the one I used while drawing. 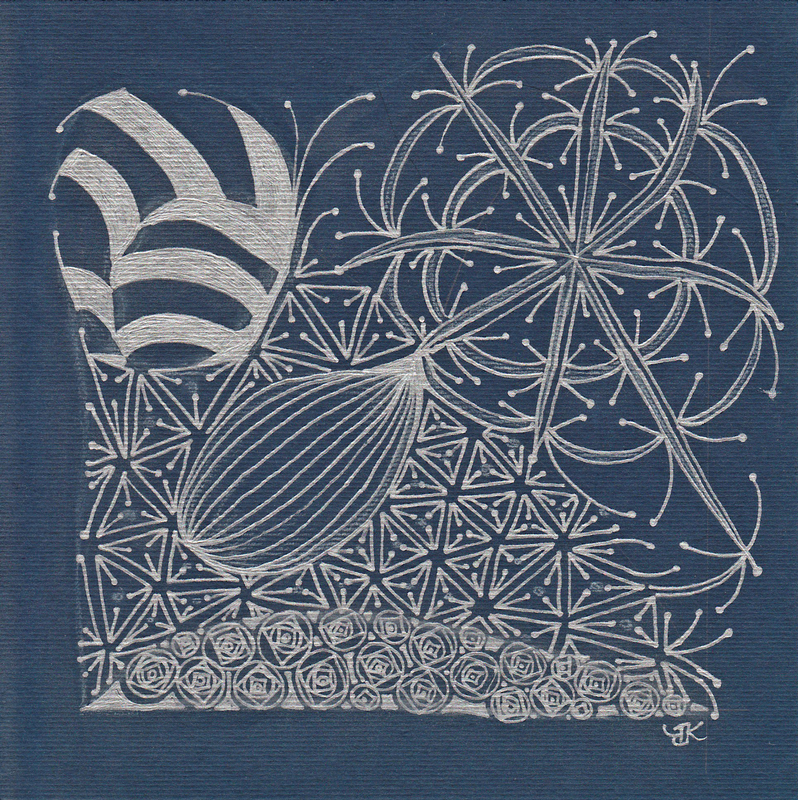 Zentangles are much like America, ever-changing depending on your view, but always the same at their core.